[/caption]A beautiful and peaceful Christmas-time picture of The Strait of Hormuz was shot from the International Space Station (ISS) soaring some 250 miles (400 kilometers) overhead on Christmas Eve, 24 Dec 2011. Today, the economically vital Strait of Hormuz is a ‘Flashpoint of Tension’ between Iran and the US and much of the rest of the world community because of official threats by Iranian government officials to shut the highly strategic waterway to crude oil tankers that transport the lifeblood of the world’s economy. The timely image above was just tweeted by NASA Astronaut Ron Garan who wrote; “Interesting peaceful pic of the #StraightofHormuz #FromSpace taken on Christmas Eve (12/24/11) from the #ISS”. Garan served aboard the ISS from April to September 2011 as a member of the Expedition 27/28 crews. The Strait of Hormuz lies at the mouth of the Persian Gulf between Iran and the Arabian Peninsula and is a major chokehold of the world’s energy consumption. At its narrowest point, the Strait is only 34 miles (54 kilometers) wide. The vital shipping lanes span barely 2 miles (3 kilometers) in width in each direction (see maps below). 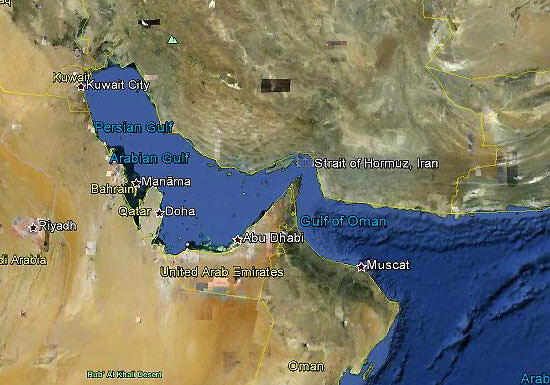 See more ISS photos of the Persian Gulf region and the Strait, below. Each and every day, about 20% of the world’s daily petroleum consumption is shipped through the extremely narrow channel on gigantic Oil tankers. Any disruption of petroleum shipments would instantly send crude oil prices skyrocketing to exhorbitant levels that could wreak havoc and rapidly lead to a worldwide economic depression and a devastating war between Iran and the US and its allies. Red arrow indicates location of the Strait of Hormuz in relation to the Arabian Peninsula. In recent days Iranian boats have approached US Naval warships at high speeds while they were heading through the Strait of Hormuz – playing a potentially deadly game of cat and mouse that could spin out of control in a single misstep, even if unintentional. Clashes would easily disrupt the crude oil tanker shipping traffic. Several Iranian speedboats came within about 800 yards of the US vessels in recent days as a war of words has flared over oil and Iran’s nuclear program as tensions escalate. The US and allied fleet operates in the Gulf region to protect the oil shipments and the oil installations of a number of Arab countries including Saudi Arabia. An international crew of six men from the US, Russia and Holland are currently in residence aboard the ISS running science experiments. ISS Expedition 30 Commander and US astronaut Dan Burbank snapped gorgeous photos of Comet Lovejoy during this Christmas season – look here. Mars Science Laboratory, launched three days ago on the morning of Saturday, November 26, is currently on its way to the Red Planet – a journey that will take nearly nine months. When it arrives the first week of August 2012, MSL will begin investigating the soil and atmosphere within Gale Crater, searching for the faintest hints of past life. And unlike the previous rovers which ran on solar energy, MSL will be nuclear-powered, generating its energy through the decay of nearly 8 pounds of plutonium-238. This will potentially keep the next-generation rover running for years… but what will fuel future exploration missions now that NASA may no longer be able to fund the production of plutonium? Pu-238 is a non-weapons-grade isotope of the radioactive element, used by NASA for over 50 years to fuel exploration spacecraft. Voyagers, Galileo, Cassini… all had radioisotope thermoelectric generators (RTGs) that generated power via Pu-238. But the substance has not been in production in the US since the late 1980s; all Pu-238 has since been produced in Russia. But now there’s only enough left for one or two more missions and the 2012 budget plan does not yet allot funding for the Department of Energy to continue production. Video: what is plutonium really like? Plutonium is nasty stuff. It is a strong alpha-emitter and a highly toxic metal. If inhaled, it exposes lung tissue to a very high local radiation dose with the attending risk of cancer. If ingested, some forms of plutonium accumulate in our bones where it can damage the body’s blood-forming mechanism and wreck havoc with DNA. NASA had historically pegged a chance of a launch failure of the New Horizons spacecraft at 350-to-1 against, which even then wouldn’t necessarily rupture the RTG and release the contained 11 kilograms of plutonium dioxide into the environment. Sampling conducted around the South Pacific resting place of the aforementioned Apollo 13 LM re-entry of the ascent stage of the Lunar Module, for example, suggests that the reentry of the RTG did NOT rupture the container, as no plutonium contamination has ever been found. The implications of this factor may be grim for both manned and unmanned space travel to the outer solar system. Juxtaposed against at what the recent 2011 Decadal Survey for Planetary Exploration proposes, we’ll be lucky to see many of those ambitious “Battlestar Galactica” –style outer solar system missions come to pass. Exploit other RTG sources at penalty. As mentioned previously, other nuclear sources in the form of Plutonium, Thorium, and Curium isotopes do exist and could be conceivably incorporated into RTGs; all, however, have problems. Some have unfavorable half-lives; others release too little energy or hazardous penetrating gamma-rays. Plutonium238 has high energy output throughout an appreciable life span, and its alpha particle emissions can be easily contained. Design innovative new technologies. Solar cell technology has come a long way in recent years, making perhaps exploration out to the orbit of Jupiter is do-able with enough collection area. The plucky Spirit and Opportunity Mars rovers(which did contain Curium isotopes in their spectrometers!) made do well past their respective warranty dates using solar cells, and NASA’s Dawn spacecraft currently orbiting the asteroid Vesta sports an innovative ion-drive technology. Based on the realities of nuclear materials production the levels of funding for Pu238 production restart are frighteningly small. NASA must rely on the DOE for the infrastructure and knowledge necessary and solutions to the problem must fit the realities within both agencies. Thanks to David Dickinson for the use of his excellent article; be sure to read the full version on his Astro Guyz site here (and follow David on Twitter @astroguyz.) Also check out this article by Emily Lakdawalla of The Planetary Society on how the RTG unit for Curiosity was made. Growing up on Star Trek, I was always told that space was the final frontier. What they never told me was that space is about as friendly to the human body as being microwaved alive in a frozen tundra–in essence, shelter is a necessity. Like any Earthen home or building, an off world shelter on the Moon or Mars will need energy to keep its residents comfortable (not to mention alive), and power outages of any sort will not be tolerated–unless a person desires to be radiated and frozen (which is probably not a great way to “kick the bucket”). While some may look towards solar power to help keep the lights on and the heat flowing, it may be wiser instead to look at an upcoming “fission battery” from Hyperion Power Generation to power future colonies on the Moon, Mars, and perhaps an plasma rocket powered starship as well. Originally created by Dr. Otis Peterson while on staff at the Los Alamos National Laboratory in New Mexico, Hyperion Power Generation (which I’ll call HPG for short) has licensed Dr. Peterson’s miniature nuclear reactor which are actually small enough to fit inside a decent sized hot tub. Despite their small stature (being 1.5 meters by 2.5 meters), one of these mini-reactors could provide enough energy to power 20,000 average sized American homes (or 70 MW’s of thermal energy in geek speak) and can last up to ten years. Since HPG is designing these mini-nuclear reactors to require little human assistance (the “little” having to do with burying the reactors underground), these “nuclear batteries” would enable NASA (or a wealthy space company) to power an outpost on the Moon or Mars without having to rely upon the Sun’s rays–at least as a primary source for power. HPG’s mini-reactors could also help power future star ships heading towards Jupiter or Saturn (or even beyond), providing enough energy to not only keep the humans on board alive and comfortable, but provide enough thrust via plasma rockets as well. Scheduled to be released in 2013, these mini-reactors are priced at around $50 million each, which probably puts it outside the price range of the average private space corporation. Despite the cost, it may be wise for NASA, the European Space Agency, Japan, India and (if the US is in a really good trusting mood) China to consider installing one (or several) of these mini-reactors for their respective bases, as it could enable humanity to actually do what has been depicted in scifi films and television shows–seek out new homes on new worlds and spread ourselves throughout the universe.